In large bowl, combine crushed Reese's™ Puffs™ Cereal, Peanut Butter and butter. Mix well. Add powdered sugar, a cup at a time, until you have a firm dough. You may need to add up to 1 additional cup sugar, depending on your climate. Roll into 1 inch balls and place on wax paper. If making suckers, dip each stick in a little bit of melted white candy melts and push one into each peanut butter ball. Place in fridge for about 5 minutes to harden. Dip each ball into melted White candy melts and set on wax paper to harden (about 5 minutes). When set, dip one side into melted red candy melts. Using a toothpick, drizzle some extra red around the edges to look like the eyes are bloodshot. Press one chocolate chip, pointed side down, into the center and let set completely. 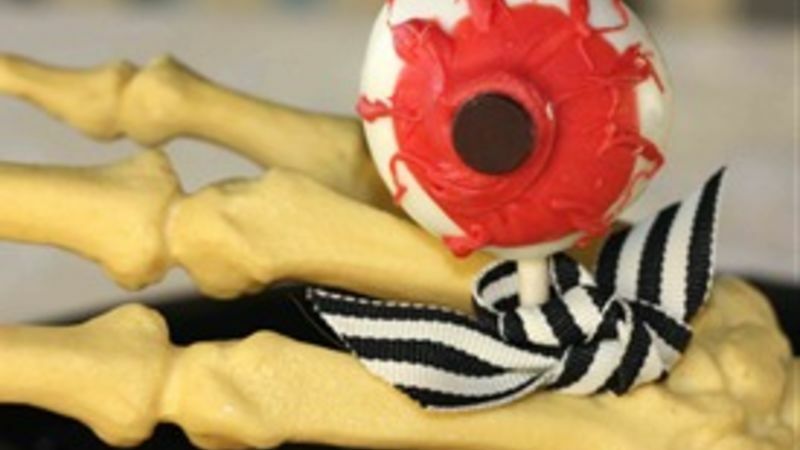 These Peanut Butter Truffle Eyeball Suckers were a huge hit! Not only do they look great, they taste fabulous thanks to the addition of crushed Reese's Puffs Cereal. Mix up the dough ingredients, roll into 1" balls and place on wax paper. Here's an example of the "bloodshot" eyes. My kids loved doing this part! Mandy Heaston is a busy mom, gourmet cook -- and opera singer! She brings FUN (and, yes, singing) to the kitchen with easy recipes that inspire families to cook and eat together.